Maps and schematics may be out-of-date, with some marketed routes potentially blocked permanently due to local building or environmental changes, or temporarily inaccessible due to the impacts of the emergency, such as flooded roads, car accidents or fires. This can make it hard, in real-time, to ensure people in the affected area are getting to safety, particularly when pre-planned evacuation routes may be affected by blockages or congestion. 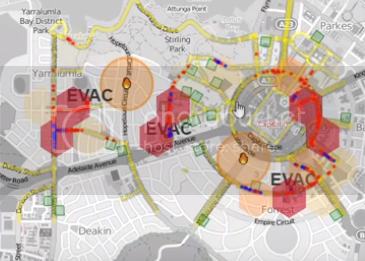 Our first GovHack 2018 project, Safer Evacuations, allows first responders to model evacuation situations in urban environments, testing for choke points and adapting the model to review different scenarios where some of the safe evacuation routes are blocked. Using population, map and location data, they are able to plan for different scenarios and prepare plans to address different emergency scenarios. We've also developed Safer Evacuations to be useful in real-time during emergency situations. When an actual emergency requiring an urban evacuation develops, first responders are able to use data projections of population to understand how many people are affected and need to evacuate - and can mark blocked evacuation routes on the map, allowing them to share information on which routes are safe while also identifying where the new evacuation choke points may be forming (visualised as a heat map over the location map). Using this real-time modelling, first responders can better coordinate an evacuation from any urban area, sending additional personnel to choke points to help manage the evacuation flow, and inform the public about the safe routes that authorities prefer people take out of the area to reduce the potential for people to get hurt. With additional time, and applying a more sophisticated AI model, it would be possible to extend this to app environments where both first responders and the public could share relevant information, or a city authority could provide instructions to each individual or family on their specific evacuation route out of an area, and flag when they were taking an alternate, more dangerous route, and help guide them back towards safety while adjusting the evacuation routes for others to minimise the occurrence of chokepoints. The ability to mark unsafe areas and safe evacuation routes would also allow first responders to map specific routes they need to keep clear to bring in emergency vehicles to help the injured, keeping these clear of evacuating citizens, who would be directed to other safe routes via the Safer Evacuations service. Safer Evacuations will help first responders across Australian and the world to improve their urban evacuation planning through testing different emergency scenarios. In the unfortunate event where an emergency occurs, the service will support first responders to map the safe routes out of the affected area, reallocating their forces in real-time as the situation changes to help direct the public to safe evacuation routes while managing chokepoints, allowing them to reach safety without impeding official emergency relief operations. To build this model we've used an openstreet map base, and an opensource script for modelling the movement of the people as they evacuate, supported with government datasets to define the population levels, key points people would be leaving from to evacuate, and the key locations they will evacuate to. It would be possible to expand these to include electoral and council boundaries, and to incorporate other geospatial sets detailing key landmarks or other relevant structures and green spaces. It would also be possible to extend Safer Evacuations to non-urban areas with the incorporation of relevant datasets, to address emergency situations such as large bushfires, earthquakes and similar situations. Description of Use: Used to identify embassy locations for mapping dignitaries for evacuation planning - used as source locations for ambassadorial staff in the Safer Evacuations map during evacuation modelling. Description of Use: Used to map population by suburb - required in addition to the population numbers to associate the correct populations by suburb. Description of Use: Used to create both Evacuation points and to associate high risk groups of residents requiring support in an evacuation (marked in a distinctive colour in the Safer Evacuations service. Description of Use: Used to map population by suburb for emergency evacuation planning across the entire ACT.